Columbia State Historic Park is one of the most popular places for California elementary school groups to visit. Most California Schools teach California history in the fourth grade with a partial focus on the discovery of gold. Field Trips by the hundreds come to Columbia for the “hands on” experience their students can enjoy. Through a reservation system, the park staff interprets Columbia History to over 20,000 students each year. Untold numbers of other children visit the park without the benefit of the staff program. The school group interpretive program is presented in two parts, one conducted at the museum and the other conducted at the historic schoolhouse. At the museum the children are given a talk on Columbia History by a Ranger, Interpreter, etc., or a Docent staff. This portion of the program takes approximately forty-five minutes. The other portion of the program is conducted by a costumed docent that is acting as an 1860’s Columbia school teacher. 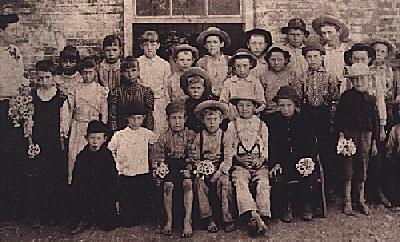 The children are brought into the classroom and given a lesson similar to one that would have been taught in the 1860’s. This section takes about one hour. It takes around fifteen minutes to walk from the museum to the schoolhouse. Teachers may also chose other related activities with a theme around the Gold Rush era to fill their day. In conjunction with the above mentioned activities Columbia Merchants/Concessioners offer certain school specials programs or discounts towards your well planned day in Columbia. For those schools that are unable to obtain a reservation, written lesson plans and other materials are available from the Friends of Columbia State Historic Park. In previous years, we have mailed information concerning our school group program to schools on our mailing list. Please contact us if you wish to be added to our emailing list so that you can be notified. You may also obtain information concerning the school group by calling the State Park office at 209-588-9128.